A question that comes up often amongst multi-lingual families is how to motivate their children to speak their native language, or a second or subsequent language. It's a big topic, discussed often in multicultural circles. Click image for affiliate link. 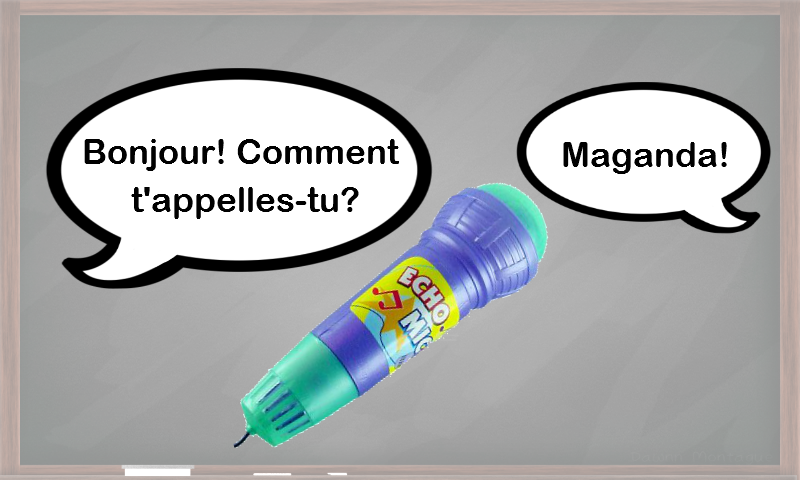 Yep, it's a little trick we picked up from our time at Language Stars, and it's an easy $3-ish investment: the echo microphone! Here's how it might go down with Mommy and Big Brother Johnny interacting within range of Little Sister Sally. Mom holds the microphone and puts it to Johnny's mouth when it's his turn to respond. Johnny: Ça va bien, bien, bien! Mom repeats the routine with a few puppets or stuffed animals, using exaggerated, funny voices for the animals. In the absence of other environmental distractions, Little Sister Sally will, at the very least, want a turn holding the microphone sometime during this routine. She may or may not try to ask or respond to the target question at first, but it invariably comes. Once you've maximized this routine, you can expand the repertoire. Include questions such as "What is your name?" and "How old are you? ", questions that kids love to answer in those early years. Of course, the microphone can be used any time, not just in formal practice time. As the family comes through the kitchen at meal time, ask each one what s/he wants to drink, "jugo o leche," and hold the microphone to them for their response (game-show style!). If you're feeling energetic, you can even repeat each person's response in a full sentence, with a little sing-songiness and a dance. A little one will not want to be left out of this exciting event that makes everyone's drink choice a big deal. You can picture it already, right?! At your wit's end, hoping for more language participation? Try an echo microphone, then come back and tell us how awesome it went! You can order echo microphones from amazon (affiliate link here), or just as easily pick one up at a party store, dollar store, or a big box discount store (usually in the party favor section). For those honoring Black History Month for the first time, it can be a little overwhelming to get started. The recent Multicultural Children's Book Day is a great place to go for books for the month. (You can see my MCCBD review of Josephine: The Dazzling Life of Josephine Baker here.) Multicultural Kid Blogs is getting a nice list of resources going on Pinterest, as well as a good link-up on their website. Myself? I hoped to fill in the gap of missing resources for Spanish dual language programs, and created an introductory-level unit in Spanish for el mes de la historia afroamericana. Students will meet 10 African Americans of historic significance in this packet, at an introductory level. The biography of each figure is 3-4 sentences long, highlighting the most salient aspects of each one's life, at a manageable level for elementary students. This set introduces: Ruby Bridges, Frederick Douglass, Martin Luther King Jr., Thurgood Marshall, Jesse Owens, Rosa Parks, Jackie Robinson, Sojourner Truth, Harriet Tubman, and Booker T. Washington. 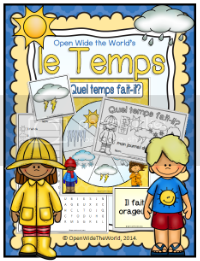 Included in this packet are: bulletin board display pieces (name plate, image, photograph, and bio) and timeline cards, a 3-in-a-row bingo game, writing journal pages, and a matching worksheet. It's all here and ready to go! Of note: all writing on student pages is in Spanish; there is no English on student pages. This packet is available in my shop at Teachers Pay Teachers. Et vous? 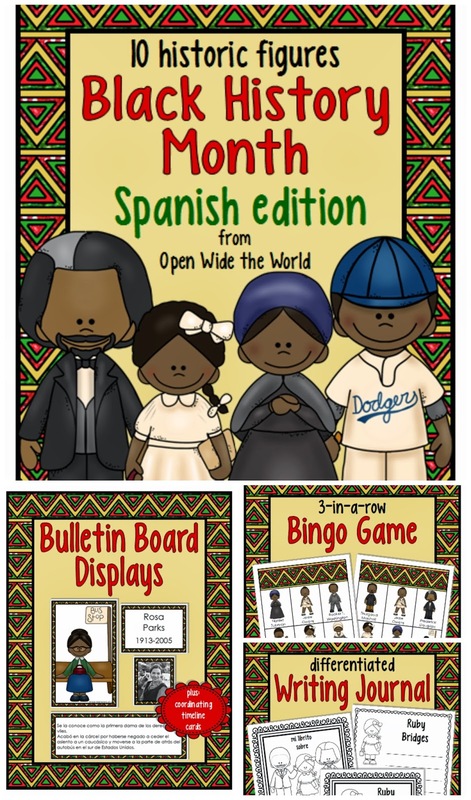 Have you found any great resources for Black History Month in other languages? I would love to see them! Je vous présente: "Josephine: The Dazzling Life of Josephine Baker"
Way back somewhere in, oh, say, high school French class, it might have been, I once did a report on Josephine Baker. So I have been peripherally aware of her existence for some time. But how much one forgets in the decade (okay, 2 decades!) since high school. Disclosure: I am an amazon affiliate. This post contains an affiliate link. 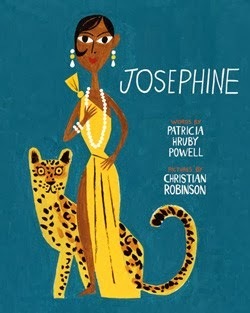 And so I was thrilled to receive an advance copy of Chronicle Books' Josephine: The Dazzling Life of Josephine Baker, by Patricia Hruby Powell, to review for Multicultural Children's Book Day. A fascinating life story is always a good start in a biography, but in the case of Josephine, it is the artwork that sets this book apart. Billed as a book for ages 7-10, and certainly appropriate for that range, the artwork actually gives Josephine the feel of an eclectic and quirky coffee table book, the likes of which one finds in the gift shops of the great art museums around the world. Josephine is just as easily a book for adults as it is for children! Click image to see more on Scribd. How fabulous that Josephine mentions more than a dozen countries (lending itself to some fun map exploration! 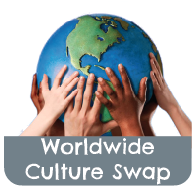 ), encourages the bridging of racial boundaries, and promotes world religions as being worthy of respect. What more could a world-focused family ask for in a book?! 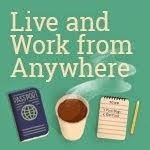 As the title of this post might attest, I am a huge fan of code mixing. I love seeing, or writing, a few contextually obvious words of another language amidst the text of the primary language. Although fewer than 10 French expressions are included, they are fun ones, easily assimilated by language savvy kids. C'est magnifique! As I mentioned, the artwork in Josephine allows this book to be enjoyed long past the 10-year old top margin it is billed for. On the other end of the spectrum, however, some 7 year old children may not be ready for the depth and breadth of issues mentioned in Josephine. You might want to wait on Josephine for a year or two if your 7 year old has had minimal exposure to concepts and vocabulary such as: nickel whisky shots, race riots, the term "out of wedlock", multiple marriages/divorces, the description of men in white hoods (whose name I won't mention, to avoid coming up in web searches), etc. Children will certainly face all these topics eventually, but it could be a lot all at once for some 7 year olds, so judge your audience wisely. From beginning to end, I thoroughly enjoyed the time I spent with Josephine: The Dazzling Life of Josephine Baker. Many thanks to Chronicle Books for sending it, and a heartfelt congratulations to author Patricia Hruby Powell and artist Christian Robinson on their job well done! I wish you many successes with Josephine, and your future endeavors! Just in time for the the release of Josephine, Chronicle Books is offering some fun FREE materials for children. and make a cute little banana bracelet inspired by -ahem- "the" skirt! How about more multicultural children's book reviews? Many thanks to the generous sponsors of Multicultural Children's Book Day! Multicultural Children's Book Day: Sponsor Give-Away! Multicultural Children's Book Day is fast approaching! In honor of the event, one of the wonderful sponsors, Wisdom Tales, is hosting a give-away... of their entire set of children's books!!! Yowzers! Click the image to check it out! With Multicultural Children's Book Day coming up, can you guess what I received in the mail today? My review copy of a looks-to-be fabulous new release called "Josephine." I'll say no more until my full review. Until then, I'll leave you with this fun little teaser. 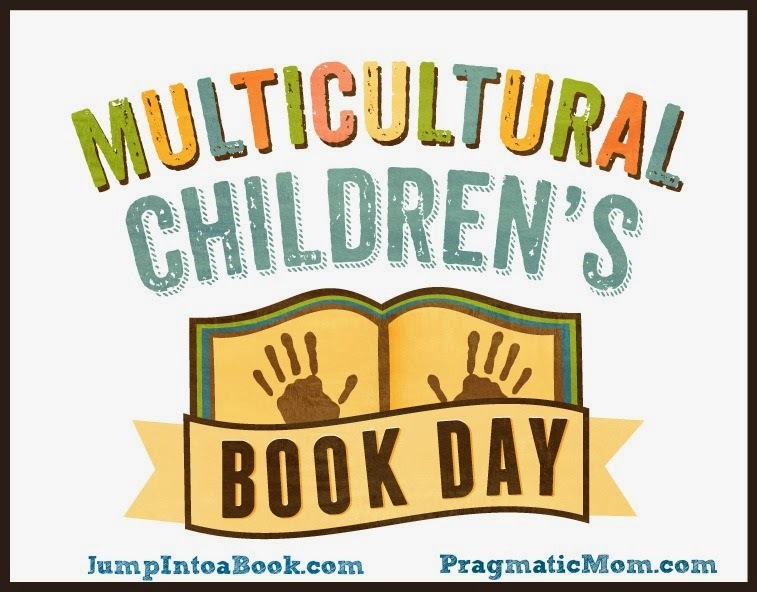 Coming Soon: Multicultural Children's Book Day! Being part of a multicultural family full of book lovers, I was very interested by the following data shared by Mia of Pragmatic Mom and Valarie of Jump into a Book. Despite census data that shows 37% of the US population consists of people of color, only 10% of children’s books published have diversity content. As self-proclaimed children's reading and play advocates, Mia and Valarie are on a mission to change that. Through "Multicultural Children’s Book Day: Celebrating Diversity in Children's Literature," Mia and Valarie are working to raise awareness for kids books that celebrate diversity, and to get more of these books into classrooms and libraries. Watch for books, links, info, and fun coming your way, on January 27th, right here on Open Wide the World! If you have been working on sight words with your Spanish-speaking or Spanish-learning kinders, and have enjoyed having some seasonal flashcards (like this Christmas set and this fall set), you might enjoy this final installment of the series, available at my store on Teachers Pay Teachers: Kindergarten Spanish Sight Words, Snowman Edition. 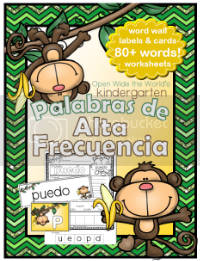 Click the image to access the January flashcards and a corresponding "Yo tengo/¿Quién tiene?" game. Hey, Spanish teachers and homeschoolers! By teacher request, I have created a set of elementary level, winter-themed Spanish daily writing journal pages for January. While a writing journal is fun enough on its own (heehee! ), I thought I'd try something even more fun to kick off this product: make it a Progressive Product! What is a "progressive product"? A super fun deal, that's what!!! Or, more specifically, it is a product that you can purchase at a now at a base rate, then download FREE additions each month as they are released. Here's how that works: once you purchase a file through Teachers Pay Teachers, you are able to access all its future updates through your "My Purchases" page. So purchase now, then at the end of each month, head to your "My Purchases" page and re-download the file to access the addition for the following month. For FREE! But with each addition comes a $1 increase in price to new buyers, so the best deal comes to those who buy early! Spanish Daily Writing Journal, PROGRESSIVE PURCHASE! Thanks, teachers, for your continued suggestions and ideas for products! It is always an honor and a pleasure to work with those who shape the future of our children. ¡Mil gracias!